Our portable deadweight anchor system is quick and easy to handle. Very often there are just two men assembling the system and it is down to them to take the necessary components up on the roof, lift and re-position them as necessary, and take back down again. It can be heavy and time consuming work. To solve these problems, Kee Safety takes a modular approach to roof man anchor systems. By using individual, smaller components, our range of roof anchor devices are much easier to lift and carry to and from the point of use; a basic system weights only 250Kg, with no single item weighting more than 25Kg. Weightanka® is a non-penetrating, portable, deadweight anchor device designed for use on roofs with up to a 5 degree pitch for temporary or permanent applications where the installation of passive or collective protection, such as guardrails, or permanent anchor devices is not viable. Weightanka® utilises a central pedestal (attachment point) to raise the height at which the arrest force is applied and so reducing the distance the anchor device moves during a fall-arrest event. The Weightanka® system conforms to Class E of EN 795 standards and is approved to meet the PPE Directive. For use on all roof surfaces, including single-ply membrane, asphalt, concrete, stone chippings (brushed) and mineral felt. Weightanka® features base weights fully encased in rubber moulding to prevent the pads from peeling at the edges. The Weightanka® system is very quick and easy to assemble, utilising a minimum of loose components, and does not penetrate the roof surface or require any structural attachments. Metal components are galvanized to BS EN ISO 1461 for corrosion resistance and long life. Wireanka® is a system of EN795 Class E deadweight anchor devices designed to support Kee Safety's BS EN 795 Class `C' horizontal, flexible safety lines. A non-penertrative hands free, horizontal lifeline solution on flat roofs up to 5 degrees, for temporary or permanent applications. The system can incorporate corners and allows spans of up to 15m in between intermediate supports. As the penetration of the roof surface is not required the additional cost of waterproofing is avoided and there is also no need to drill into or open up the roof, allowing the buildings use to be unaffected during installation. Suitable for up to two users working in fall arrest and multiple users in restraint, dependant on configuration. It does not penetrate the roof, is suitable for most flat roof surfaces and requires no attachment to structural members. 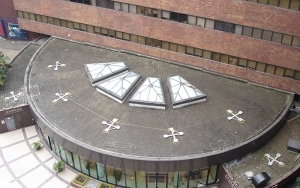 It is used in conjunction with the Weightanka® and together the systems provide an internally force balanced solution, which is extremely stable and will not migrate across the roof surface. Designed for single person use, Accessanka® has been tested for 2 users plus equipment upto a working load limit of 200Kg in case of rescue. Designed for easy transportation and installation, being of modular construction with no part over 25KG or 2M long.